If you have a small bathroom in your home, you may want to remodel it so that you can have updated fixtures, a modern look, and the appearance of a larger space. After all, you spend a lot of time in this room preparing for work or getting ready to retire each evening; being surrounded by comfort and an appealing design can help you to enjoy your time more here each day. In a small bathroom every inch is important so either you or a professional should draw up some plans and determine the fixtures that you are going to replace before you begin shopping and buying the new elements of your bathroom design. Since the focal point of your bathroom will likely be your bathtub, you may want to consider the new trend of having a freestanding bath in the bathroom. It will give a feeling of openness and help to make the bathing area look larger than it really is. Remember that you’ll have to have a place for your towels, soaps, and shampoos, so either place it close to a window with a large sill or add an attractive piece of repurposed furniture beside the tub. The professionals at http://www.jtspas.co.uk/freestanding-baths-32-c.asp can direct you to a small model or style that will fit nicely in your smaller bathroom. Update the lighting in your bathroom and use as much natural light as possible; you’ll want to use sheer curtains for the windows whenever possible so that the natural light can permeate the bathroom and brighten it up considerably. Place good lighting around the mirror that you use so that you won’t have any shadows that keep you from applying your make-up or shaving each morning. 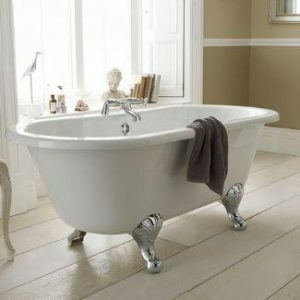 Choose styles that complement your decor so that your modern, stylish look will be consistent throughout the bathroom. If you have considered using a pedestal sink, forget that idea because this type doesn’t provide any storage space for your grooming necessities. You can find small vanities that have cabinets where you can store the things that you need each morning. Keep clutter to a minimum since this makes the space that you have look even smaller. Don’t use baskets or other containers on your floor space since this will reduce the amount of usable space that you have; you can personalise your bathroom by hanging artwork on the walls to express your sense of style. Making your small bathroom look and feel larger will take some careful planning, attention to details, and investing in fixtures that serve as attractive focal points and mask the limited space that you really have to use in your bathing area.